Dr. John Rollason (Peter Cushing), his wife and assistant are visiting a remote monastery in the Himalayas. They meet another group who are planning on searching the mountains to find the legendary Yeti. That group is led by a man named Tom Friend (Forrest Tucker). Rollason decides he wants to go with them, despite the protests of his wife. The expedition goes bad, and a member dies. The expedition leader shoots and kills a Yeti, which turns out to be a terrible idea. While a rescue party desperately searches for the missing group, Rollanson ends up hiding in an ice cave and discovering that the Yeti may be more than they appear. After four days of backwoods yokels getting roughed up by ape-men, it’s very refreshing to see something more cerebral. The script was written by Nigel Kneale, who brought us the Quatermass films and is a master at crafting intelligent and frightening scripts. 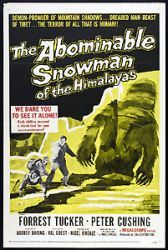 For much of its running time The Abominable Snowman is brimming with atmosphere and mystery. The black and white photography enhances the eeriness of the story. Cushing and Tucker are excellent together, watching Rollason having to deal with an increasingly obsessed Friend keeps the middle of the film from slowing down too much. The ultimate revelation of the Yeti is unsettling. I really enjoyed the fact that some thought was put into their appearance so that they are more than just huge white apes. They have enough of a human appearance that they hit the uncanny valley and become something much more sinister and strange.